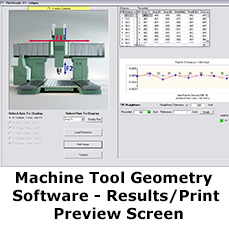 Hamar Laser’s Machine Tool Geometry Software is designed for machining center alignment. The program is used with our continuously rotating laser systems to measure and analyze the lines of motion of a machine's main axes. Geometric errors, such as flatness, squareness, straightness and parallelism, are automatically downloaded through a computer interface. 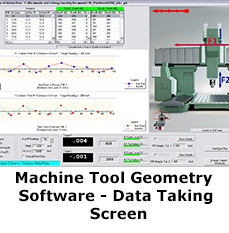 Analyzes flatness, straightness, squareness and parallelism line-of-motion geometry errors for up to 4 main machine axes. 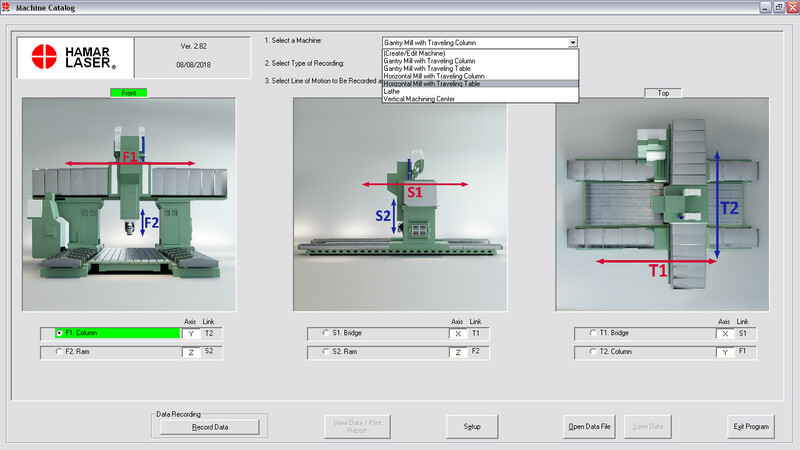 The software provides a top view, side view and front view for more efficient data taking. 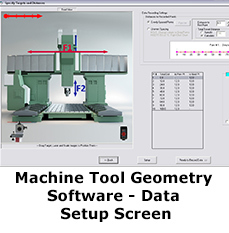 The user can select from 5 different machine types and the software will automatically display a graphic of the selected machine. For additional flexibility, the user can add Autocad®-generated artwork and can customize axis labels (W, X, Y, Z, etc.) for individual machine types. When taking data, real-time graphs automatically update with each newly-recorded point for instant identification of outliers (bad points). Graphs show TIR, high and low points, tolerance bands, squareness and parallelism errors in inches or millimeters. The user can zoom in on straightness, squareness and parallelism graphs, choose one line of motion as the datum, and choose between “forward” and “backward” lines of motion. The user can save and print recorded data, as well as recall previously saved machine data for comparison to existing alignment conditions. Reports print the analysis graphs as well as all backup data. The user can define the straightness tolerance for an individual line of motion and for squareness and parallelism between axes. The user can enter data from field notes into the software for professional report generation, analysis and data storage. 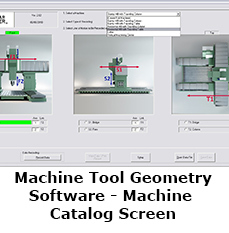 The MACHINE CATALOG screen displays front, side and top views of the machine tool and all the lines of motion for each view. The label of each main axis (X axis, Y axis and Z axis) of the machine tool can be customized to the individual machine type. 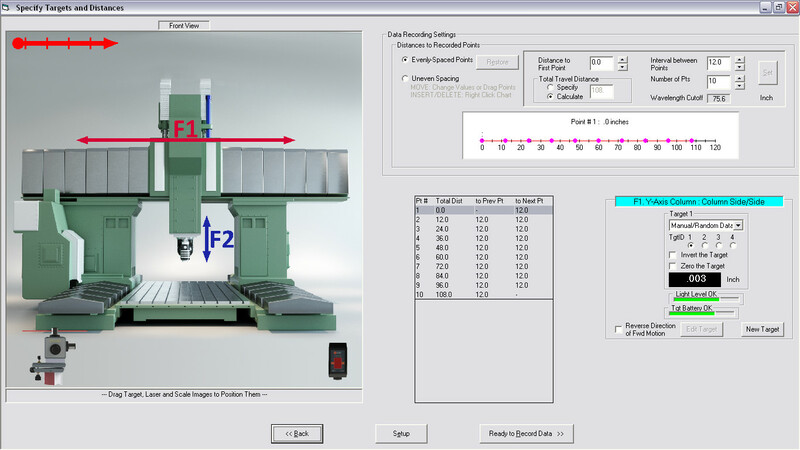 The user may choose a configuration from 5 different types of machine tools and the program automatically updates the graphics to reflect the choice. 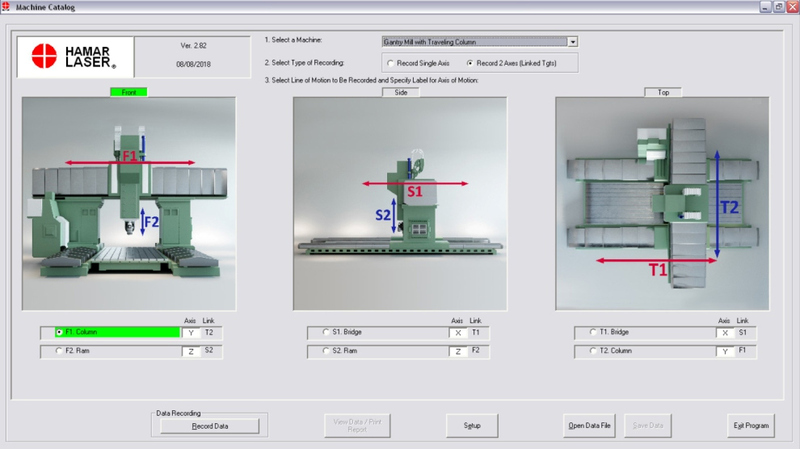 User-generated Autocad files may be substituted for specialized machines. 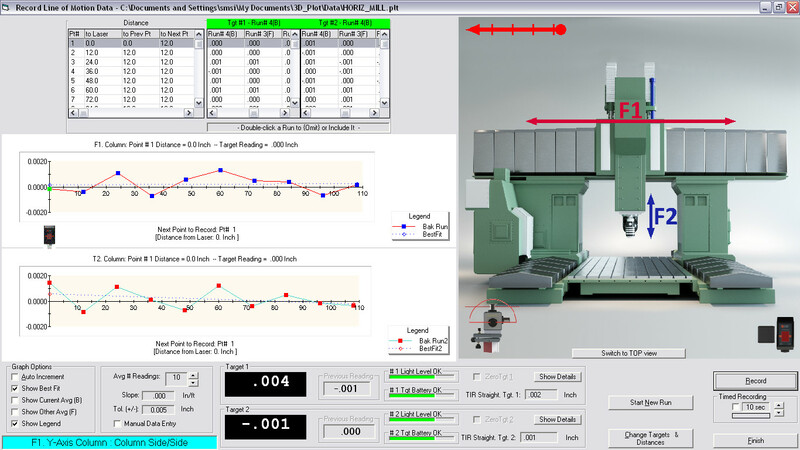 Straightness tolerances for each line of motion and squareness and parallelism between them are also selected on this screen. These screens are used to specify recording parameters and to record live data. 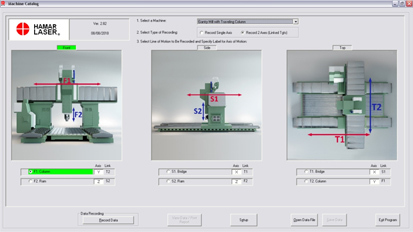 Before recording data, the user can identify targets, adjust the software to agree with the physical setup of the laser and target, and provide information about the number of points to be read and the distance between those points. The screen automatically reorients itself for vertical axes so that the real-time graph becomes vertical for column measurements. 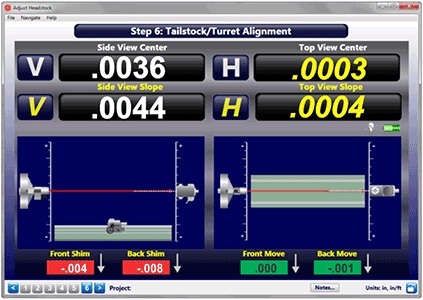 The RECORD LINE OF MOTION DATA screen displays live target data and the straightness tolerance for the selected line of motion in graph format. The graph is updated as the data is recorded. After each point is recorded, the cursor automatically moves to the next point and the least-squares, best-fit line is calculated. Multiple measurement “runs” and bi-directional data can also be recorded for each line of motion. The VIEW PLOT screen displays a graph of each line of motion for a given view (such as top view). Many viewing choices are available, such as displaying tolerance bands, TIR with high and low points, and squareness and parallelism angles (slope of best-fit line) between axes. Any line of motion can be chosen as the datum and the other axes are replotted to reflect the new reference. The angles and graphs can be zoomed in or out, and a forward-run average, backward-run average, or an overall average can also be graphed. The VIEW PLOT screen can also compare a previous set of data to the newly recorded set. 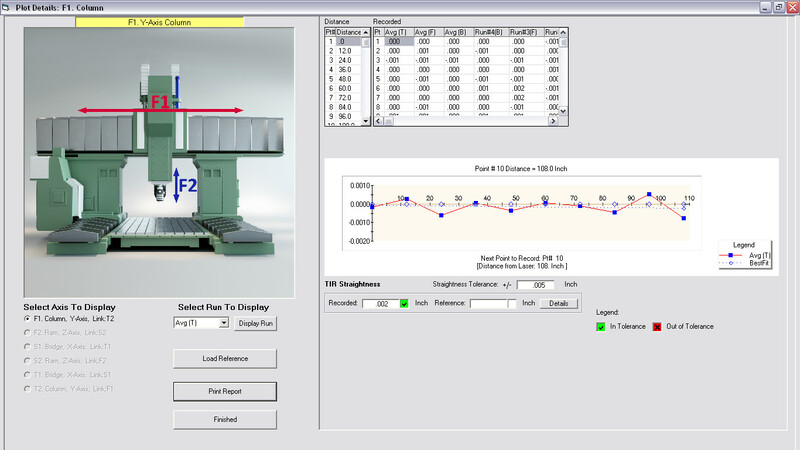 By clicking a button on the bottom of the screen, the data behind the graphs are displayed, along with their compliance to user-defined tolerances.